Salon e11ven opened its doors in March 2014. It has many sister companies dating as far back as 1981. This Coventry city hairdresser runs a none appointment based system for men, women and children. Whether you would like a quick trim or a wash cut and blow dry our specialist team are committed to providing you with a warm and welcoming experience in a great environment. You will be provided with a warm welcoming experience where staff are happy to go above and beyond. Priding ourselves in a tranquil, pleasing yet professional service. 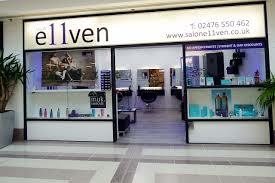 Salon e11ven engross to recruit a highly skilled team promising satisfaction each and every time. We are based in the link section of West Orchards shopping centre.